I’m not necessarily struggling with things to post about, recipes to make or even ideas. I’m struggling with the execution of those things. I’m a notorious procrastinator, I never write anything down (barely at least) and my picture-taking skills leave something to be desired. Maybe it’s my camera or that I rush shots, but I always seem to browse and squeal over pictures on other foodie blogs, but know that my own lacks something. Well they lack a lot of things. I just want to be able to take really cute pictures! At least I’m confident in knowing my food taste pretty good. Speaking of tasting good, this summer I really got into curry. Red curry, yellow curry, green curry, curries from India, Cambodia, Thailand, Indonesia. Name it and I probably got into it or its on my list of things to explore. Nothing is more comforting than a blaze of spices that warms you inside and out. I started using a ton of curry in my cooking, and not just for stew based meals either. 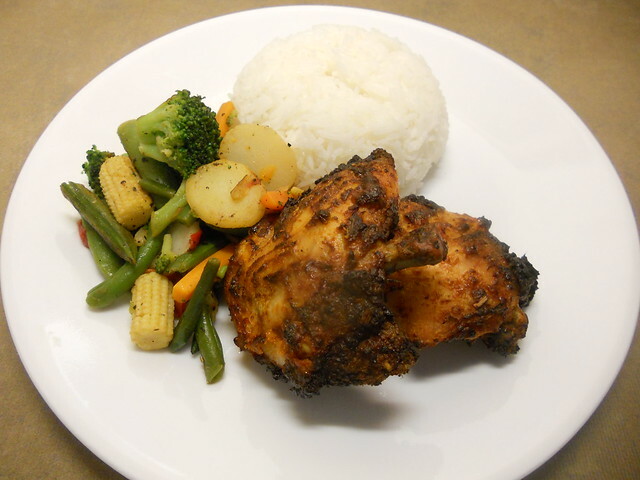 I made these Curry Spiced Grilled Chicken during the summer and absolutely adored them. 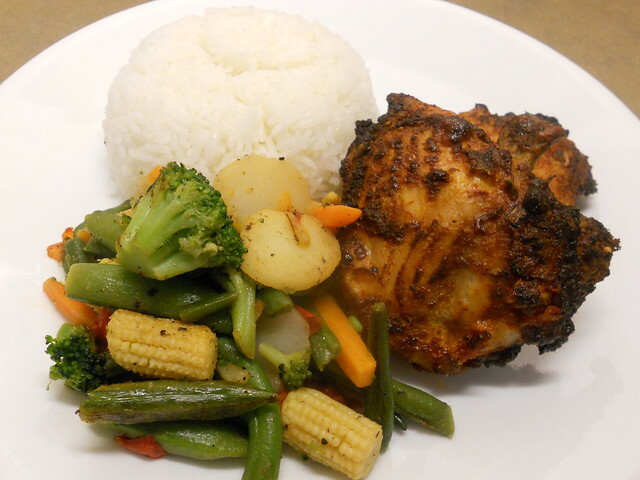 I marinated the chicken in the same spices you would find in a red curry, grilled them off til they were wonderfully charred, serve with fragrant hot jasmine rice and stir-fried vegetables for a really easy weekday meal. You can marinade the chicken between 4 hour to over night. I prefer over night to allow the flavors to really soak in. *Optional, I like a bit of heat, depending on the brand of Curry paste you buy, it might already have a sufficient amount of heat. 1. In a small bowl, whisk together curry paste, coconut milk, oil, fish sauce and sugar until smooth. Mixture should be slightly thick. 2. Put freshly washed chicken pieces in a large bowl and pour marinade over, add lemongrass, garlic, chili, black pepper and grated onion. Mix together with hands and cover with a plastic wrap. Allow to marinade in the refrigerator for at least 4 hours, but over night is best. 3. 30 minutes before grilling, pulling the chicken out (still covered in plastic) to allow it to come up in temperature, this insures even cooking through out. Right before grilling, add in the juice of one lime, mix in and grill immediately. 4. Grill over medium high charcoals until outside has a lovely char then move over towards the edges of the grill to cook thoroughly, about 15 minutes. 5. Enjoy with steamed rice, a side of simply stir fried vegetables and great conversations with your family. 2. The coconut milk does a fantastic job of keeping the chicken tender, if you don’t have coconut milk, you can substitute with buttermilk, but omit the lime juice before grilling. You can also cook this in the oven, just roast for 25-30 mins in a 375 degree oven and it taste just as good. I’m just a sucker for the charcoal charred taste. Hope you will try this recipe and as always, please write me and let me know if you enjoyed it!